The focus in High-Performance Computing increasingly turns to energy efficiency. Therefore the pure concentration on floating point operations and runtime performance is no longer sufficient. In terms of hardware, this change of paradigm has already taken place: The GREEN500 list as counterpart to the runtime performance oriented TOP500 list has been established. The new metrics take runtime and energy consumption into account. Nevertheless, all these developments consider hardware only—still an inadequate situation to face the challenges of Energy-Efficient Exascale Computing. The necessity of optimizing simulation software with respect to power and energy draft demands for detailed profiling of the power consumption during the calculations and a norm quantifying the respective efficiency. 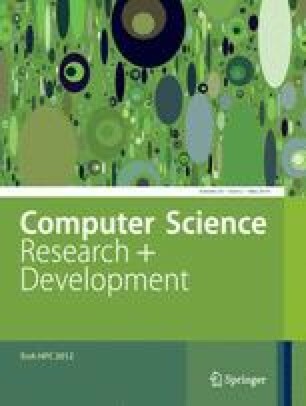 In this paper we propose a unified energy footprint for simulation software that enables a fast comparison between different models, implementations and hardware configurations, respectively. By way of example we provide the footprints for the tomographic reconstruction code PyHST optimized for CPU and GPU operation as well as the operational numerical weather prediction model COSMO. We then discuss the power and energy profiles and investigate the effects of scaling with respect to hardware resources and simulation parameters. The authors want to thank Peter Schöck, Frederic Hupbauer and Alexander Biewer for their support in employing the measurement setup. Furthermore, thanks go to KIT for funding the project in the framework of a Startup-Project.